Federal Bank Clerk Notification 2018: Federal Bank is one of the apex Private banks in India and getting a job in this bank is no cakewalk. Every year lakhs of aspirants appear for the Federal Bank exams and only a limited number of them come through it. The bank recently released the Federal Bank Clerk Notification for the recruitment of Clerical Cadres in various branches of Federal Bank. The online registration for the exam started on 14th August 2018 and the eligible candidates can apply for the exam till 27th August 2018 on the Federal Bank official website- federalbank.co.in.Nevertheless, it is suggested before applying for the Federal Bank Clerk exam 2018-2019, candidates should go through the Federal Bank Clerk Notification 2018. 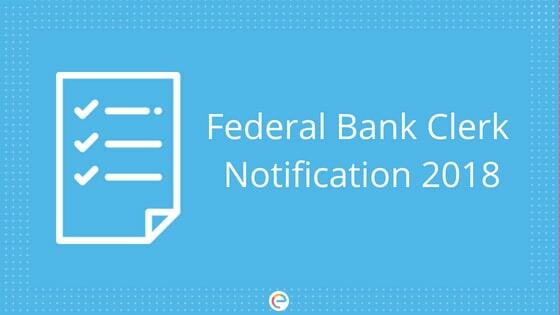 The article below provides you with all the essential information related to the Federal Bank Clerk Notification 2018. Age Candidates born on or after 1st July 1994 i.e. 26 years as on 1st July 2018 can apply for the Clerical Post. Qualification Candidates holding Graduate or Post-Graduate degree in any discipline from a recognized University with a minimum 60 percent marks and have completed the course 2017 0r 2018 can appear for the exam. Step 1 Visit the official website of the Federal Bank – federalbank.co.in. Step 2 Click on the ‘Careers’ tab. Step 3 Click on ‘Current Openings’. Step 4 Click on ‘Recruitment Process 2018-19’. Step 5 After going through the instructions click on ‘Apply Now’. Step 6 Click on ‘Click Here for New Registration’. Step 7 Enter your Name, Email ID, Mobile Number etc. and get yourself registered. A Provisional Registration Number and Password will be generated for you that is to be noted down by you. You can log in again with this Registration Number and Password later. Step 9 Fill up the Academic and Personal Details. Step 10 Verify the details and visit the ‘Payment’ tab. Step 11 Make payment of Federal Bank Clerk Application Fee. Each wrong answer carries a negative making of 0.25. The Online Aptitude Test will be followed by a psychometric questionnaire to which the candidates have to answer within 15 minutes. Aspirants shortlisted from the Online Aptitude Test will be called for the second phase of the selection process- Group Discussion and Personal Interview. The Federal Bank Clerk Admit Card will be released on the Federal Bank Official website – federalbank.co.in. Aspirants will be informed through SMS/Email on their registered phone number and Email ID. Candidates will have to log in using their Registration Number and Password (generated during online registration) to download their Admit Card. On selection and joining, Federal Bank Clerical Officers will have to serve a probation period of 2 years. Now that you are aware of Federal Bank Clerk Notification 2018-19, go ahead and apply for the exam if you fulfill all the eligibility criteria. With just a few days left for the exam, its time to take things seriously and brush up your banking knowledge further. Taking a few mock tests on Federal Bank Clerk will definitely help you in the long run. You can take bank mock tests on Embibe for free. We hope this detailed article on Federal Bank Clerk Notification helps you. If you have any query regarding Federal bank Clerk Notification, drop a comment below and we will get back to you.